Bad: Humid summers might be a problem. Plastering 3 layers inside and out is a 2nd job. Eventually, the per square foot cost vs. benefits is about the same as a regular house. Mice sometimes move into the walls. Bad: steep learning curve for builders. sometimes the skin, which is strustural, gets wet and delaminates. Quality control by mfrs has been hit-or-miss. per square foot cost vs. benefits is about the same as a regular house. Mice sometimes move into the walls. Good: External disaster proof. Quiet. Very insulated. Bad: Fires turn house into crematorium. Concrete and rebar are expensive. Concrete production makes too much greenhouse gas. Additions and adaptations are complicated due to penetration of concrete walls. Good: Stronger than steel. Can bend under strain but will rebound. Bad: Technology too new. Company responses very slow. I've also explored the pre-fabricated methods. The great thing about these is the modern architecture that can be found. It's also usually the modern pre-fabs that contain more greener technologies. So I thought about alternative structures to achieve low cost living as well as reduced earth impact. Good: Heat circulates very effectively. Bad: So do smells and sounds. So many joints make leaks inevitable. Resale population limited. Bad: Trailer living interior. Unattractive. Limited resale population. Bad: Expensive, dark, damp, lots of concrete. Limited resale population. I ended up buying another house but it is much smaller than my previous house. It turns out a family of 5 can live in less than 1100 square feet which is also cheaper to heat. In a full day below freezing I kept it at 72 degrees with a fireplace insert wood stove with a blower all day. The furnace never came on. I'm happy with this house but I'd still like to live on a big patch of land within a bicycle commute to work. What I want is a simpler life. Less impact on land. Less taxes out of my wallet. Less money for heating. No mortgage. A stable structure. But a cool structure. I have a new idea. What if permanency wasn't required? What if you didn't like your site location and wanted to move to a better part of your land? What if building and rebuilding was easy and cheap? What if close quarters were OK? What if additions were cheap and easy? What if your home cost less than your car? Imagine how drastically that changes your family budget. See all these links and these links, too. Interesting post. My life is so cluttered, especially with books. I am overrun by them. But I need to do alot of research for my job. I'm a pastor and part of that vocation is ongoing growth and learning. 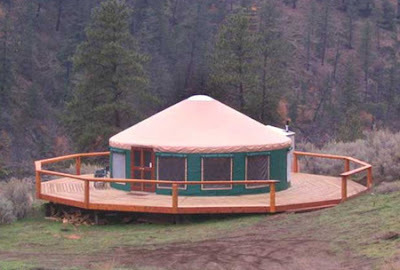 I like the yurt. There i9s no question that our culture is headed for a day of reckoning. It is unavoidable. we have become so spoiloed and addicted to creature comforts. I'm just as bad as anyone. I grew up in a subdivision in Mass. in the 60's and early 70's. It was a slab house. Very small by today's standards. We felt comfortable in that place and it was fine. Now, tht house would make me claustraphobic. My family had 3 [I was an only child] people, but many in that neighborhhod had had 5-6 ki9ds or more in the same 3 bedroom houses. But we didn't have a 1/3 of the possessions we have now. We are a book loving family too. I would have to install a separate shed for our library, which I think would be pretty neat. But this plan is only now gestating. I'd want a root cellar too. Maybe a garage/workshop. Okay, I'm only half joking. I am envious and long for simplicity. It all gets cluttered and hectic and expenisive so quickly. And I don't think the "stimulus package" is the answer!